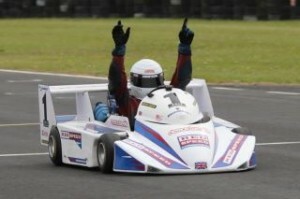 Round 3 of the MSA British Superkart Championship saw the drivers head to Ireland to the Bishopscourt circuit. With a re-surface since their last visit, lap records were set to tumble, but a problem with the timing system meant that the grid positions for heat one would be based on the current championship positions. As he remained unbeaten in the opening two meetings, Paul Platt would line up on the pole. It would be Dan Clark and Toby Davis who would head the field into turn one at the start of the first of three races, as Platt struggled away due to a carburation error, slotting in behind a fast starting Jason Dredge and just ahead of equally fast starting Francois Kishtoo, with Louis Wall, Ben Davis and Trevor Roberts just behind. Dredge was quickly past the ailing champion into third. On lap two a contentious incident between Platt and Roberts saw Roberts recovering to finish down in ninth, and a separate incident between Stephen Clark and Lee Harpham saw Clark in the tyres and both out of the race. Dredge’s race came to an end on lap four, Platt continued to nurse his kart home, so it was left to Toby Davis to win his first MSA British Championship race, setting the lap record on the way. Platt would eventually finish second to continue an impressive run of results, with Toby’s brother Ben finishing third avoiding all the troubles. 1: Toby Davis, Anderson-Honda, 10 Laps in 14m39.40, 2: Paul Platt, PVP-Honda, +5.27s, 3: Ben Davis, Anderson-Honda, +6.08s, 4: Louis Wall, Anderson-Honda, +15.36s, 5: Chris Purdie, F1-KTM 450, +21.23s, 6: Francois Kishtoo, Raider-Honda, +22.46s. FL: Toby Davis, 1m07.24 (New Lap Record). For race two, Platt had solved his issues but initially dropped down to third, with race one winner Toby Davis having “…potentially the worst start ever” also dropping through the field, Ulsterman Trevor Roberts screaming through from ninth to lead from Louis Wall, while Adam Underhill got the better of Chris Purdie on the exit of turn two to run fourth. At the end of lap one, Platt, Wall and Roberts were side by side across the line, Platt braving it out around the outside to sweep into the leader, Wall dropping from 1st to 3rd in one move, which soon became third when he dropped wide out of the chicane and yielded to Underhill. It took Underhill a further two laps to pass Roberts for 2nd, by which time Platt was into a lead he wouldn’t relinquish, with Roberts resisting Wall with Ben Davis just behind in 5th, while race one winner Toby Davis’ race ended early attempting to avoid a spin by a charging Jason Dredge. 1: Paul Platt, 10 Laps in 11:30.03, 2: Adam Underhill, Raider-Honda, +2.69s, 3: Trevor Roberts, Anderson-Honda, +5.73s, 4: Louis Wall, +5.74s, 5: Ben Davis, +7.58s, 6: Daniel Clark, F1-Honda, +17.23s. FL: Paul Platt, 1m08.10. Roberts again streaked into the lead at the start of the UK Cup race, with Paul Platt and Ben Davis in pursuit, while Adam Underhill had a difficult start having found a cracked exhaust on the grid. Once again though, Platt out-muscled Roberts at the start of lap two round the outside of turn one, with Ben Davis immediately looking to follow him through, only to be pounded upon himself by Louis Wall. As the trio, followed closely by Adam Underhill, scrapped, Paul Platt eased himself into a comfortable lead, and his race seemed to get easier when Roberts parked his kart with an engine issue, Wall suffered a broken gear selector, and Adam Underhill threw away a potential podium with a spin at half distance. Ben Davis set about reeling in Platt once he inherited second, but he simply ran out of laps, having reduced the gap to two seconds, but Platt crossed the line to seal the UK Cup in style, with Toby Davis recovering from his race two DNF to head Jason Dredge across the line for the final podium place. Lee Harpham had a difficult weekend but salvaged fifth in the UK Cup race just behind Toby and Dredge, with Stephen Clark a little further back in sixth, whilst 2011 Intercontinental Rally Champion Kris Meeke, an Irish Championship regular, capped a difficult weekend with a well-earned seventh. 1: Paul Platt, 10 Laps in 11m27.81, 2: Ben Davis, +2.05s, 3: Toby Davis, +7.13s, 4: Jason Dredge, Anderson-Honda, +7.32s, 5: Lee Harpham, Anderson-Honda, +9.09s, 6: Stephen Clark, Anderson-Honda, +10.29s. FL: Paul Platt, 1m07.44.